Mr Heng originally started a cake shop in Ang Mo Kio in 1975 but moved to Balestier in 1995 and sold only Tau Sar Piah. The working hours of 7am – 7pm were more flexible and less strenuous as compared to running the cake shop. The sales of Tau Sar Piah have increased over the years, due to their increasing popularity amongst one and all. Another reason for their progress can also be attributed to the development of Balestier Road over the years, with the replacement of shophouses with high-rise flats, and the construction of more hotels and the future Zhongshan Park. 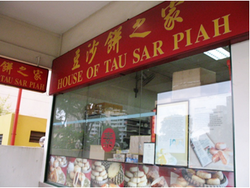 House of Tau Sar Piah is run by Mr Heng and his wife since 1995 when they shifted to Balestier and started specialising in the making of Tau Sar Piah. Here, ten different flavours of Tau Sar Piah are sold to cater to the different customers. 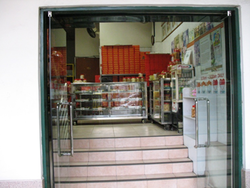 Many visit Balestier intentionally to purchase the Tau Sar Piah sold here. Since the oil used is vegetable oil, all races can savour this delicacy. The four workers in this shop include Mr and Mrs Heng, who bake 2000 to 3000 handmade Tau Sar Piah using traditional ovens. During the Mid Autumn Festival, customers have to pre-order as the Tau Sar Piah sell fast. There are many other shops flanked on the two sides of Balestier Road which sell this mouth-watering delicacy, so House of Tau Sar Piah faces stiff competition from these neighbouring shops. House of Tau Sar Piah sells sweet and salty Tau Sar Piah for 50 and 60 cents respectively, which matches the price range for other shops, from 50 to 70 cents. This is likely to be the first and last generation for the House of Tau Sar Piah, as Mr Heng's children express no interest in taking over the business, due to the strenuousness of the job.